Fresh, crisp linens every day, luxury decor and someone to clean up your room for you – living in a hotel sounds like a dream come true. 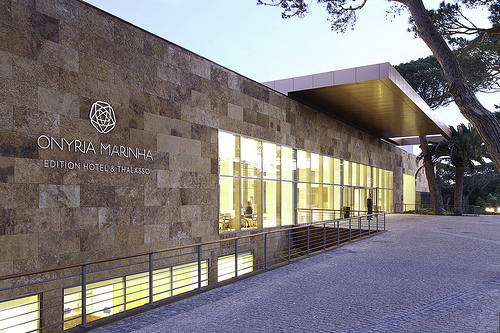 And that dream really becomes a fantasy when it’s a stunning boutique like the Onyria Marinha Edition Hotel and Thalasso in Cascais. Just imagine, waking up each morning in a pool-side villa, the Portuguese sun shining through your windows and the bright blue sky completely free from clouds. You could drink a cup of coffee or tea while wearing a fluffy bathrobe and slippers, while watching a bit of television or checking your favourite social media on your phone’s Wi-Fi. A little later, you might head down to the stunning pool for an early morning swim. Designed by architect Francisco Caldeira Cabral, the beautiful pool has a flowing, organic shape and surrounded by green lawns, fountains and sun-loungers. After your swim, enjoy breakfast in one of the hotel’s stunning restaurants – or have breakfast served to your room. With the rest of your day spread out before you, there are a number of activities you could consider. The 18-hole golf course was designed to make the most of the lovely scenery and tranquil surroundings. The Atlantic Ocean and Sintra mountains provide a picturesque backdrop as you play across the 71-par course. Another option might be a pampering day at the hotel spa. Called RitualSPA, the facility offers an array of indulgences, from saunas, hot tubs and sensation showers to therapies like body wraps, aromatic exfoliations and facial treatments. There’s also a fully equipped gym and a relaxation area. Alternatively, you could head out of the hotel for a day exploring Lisbon. The Portuguese capital is just 30km away and is sure to provide an array of opportunities, including sightseeing, shopping and sampling delicious local foods. In the evening, dine in style at one of the hotel’s fine dining restaurants. Enjoy top-quality cuisine in the stylish surroundings – and of course, attentive and friendly wait staff. After dinner, relax with a few drinks in the Drop Bar, before heading back to unwind in your freshly made-up bedroom.